I've been tagged for my first meme by dear Katherine! 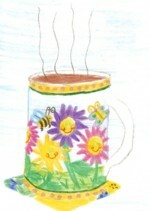 I've been having lots of fun since joining the blogosphere and I hereby tag Bridget and Suzanne. Whenever I’m cooking. I’ve heard my grandmother never boiled water without one, so I guess I’m like her. We use drying racks, not a line. Neither my mother, nor any of my aunts, had a drier so I don’t either. Yes, a few times. Someday I’d like to make Hungarian fank. The 4Real ladies inspire me! I don’t mind it but I can’t find time for it. Love those wrinkle resistant men’s shirts! In the kitchen, of course. It’s pale blue with a floral border, of course. Sitting down with my family to enjoy whatever wonderful things we have baked for the day, with a fresh hot cup of tea (of course). Isn’t that what teenage boys are for? In my house the term “hand wash” only refers to washing one’s hands. Lots of mushrooms and red peppers; black olives, purple onions and tomatoes too if I have them. Fall asleep in my nursing chair…. Recipe card box – Y/N? I actually have this ridiculous enormous expanding file stuffed with all sorts of clippings and scribbled recipes (from when someone says, “Mom, that was good! Write it down!). Someday I hope to copy the recipes, transfer it all to a nice binder and discard the historical artifacts. Cloth tablecloths and paper napkins. Theoretically once a day in the kitchen, twice a week in the living room, weekly everywhere else. Wash – How many loads of laundry do you do per week? I am the head gardener, both flower and vegetable, but I delegate much to my helpful family. My teenage son mows. My dear husband tills. Jonathan and Lydia enjoy pruning the raspberries together. 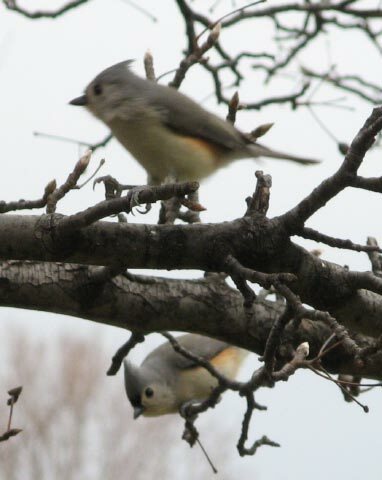 Everyone helps with weeding and spring/fall clean up. We enjoy working hard together outdoors. I log off the computer, turn off the lights and music, and carry the sleeping baby upstairs. I try to put out my husband’s clothes for the next day as he really appreciates that, but it depends on the baby staying asleep. ...but we do encourage holding hands with cute girls. 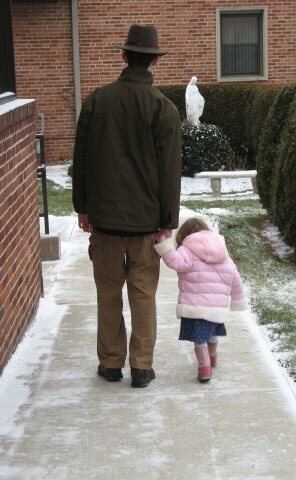 Jonathan and Eliza warming my heart with this sight after Mass. Well, yesterday I sent you to visit Elizabeth to read her amazing tale of grace. Grace in crisis, grace in sorrow, grace to trust, and the joy of Grace. It’s stories like Emily’s that first come to mind when we think of ‘crisis pregnancy’. And then there is the other kind of ‘crisis pregnancy’. The ‘crisis’ that often involves grown up women. Happily married women. Financially secure women. The supposed ‘crises’ that are discovered through blood tests and ultrasounds. The babies’ whose lives are in jeopardy simply because they are different from what their parents expected. It is those babies that are even nearer and dearer to my heart. There are mothers who would abolish their children no matter who they are. And then there are mothers who abolish their children because of who they are. 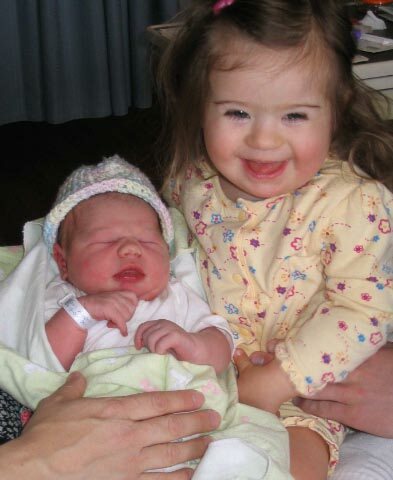 The hardest part of having a child with Down Syndrome is to look at her sweet smiling face and to realize that over 80% of the people in this country don’t think her life is worth living. To put it bluntly, they would have killed her. Just because she is who she is. She is Elizabeth Faustina. She’s that cute smiling toddler in the post below, bursting with joy and pride and sheer delight in holding her brand new baby sister. It is so hard to think that she was born into a world that doesn’t believe she should be allowed to live. This brave new world that seeks out her kind more and more vigorously, so they can be obliterated most efficiently. As our beloved Monsignor said in his homily yesterday, we live in a world that thinks wrong is right and right is wrong. God cannot have mercy and forgive when people do not admit their actions are evil. I have always loved that verse in application to the pro-life cause. How can we think of questioning the work of our Creator’s hands? God creates no accidents. He doesn’t doze off and accidentally drop a stitch in His knitting. And don't miss this Real Post. Because God's Grace is Always Amazing. 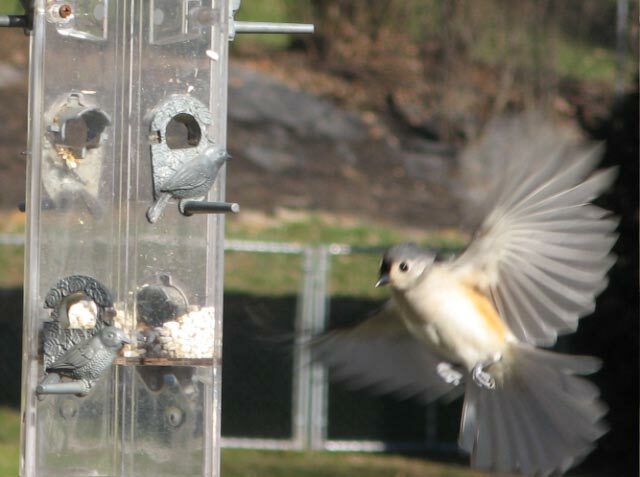 Just grabbing a quick bite to eat. Someone on the 4Real board recently asked, “What inspires you to do crafts?” I’ve been thinking about this question since I read it, not sure how to really sum it all up. I firmly believe my need to make things was inherited from my father, who was a most unique and creative craftsman in his trade of carpentry. Pondering this has conjured up many happy memories from childhood, and all of the, er, unique things I would fashion with thetrash unusual materials I had on hand. You see, those were the days before the craft wonderlands of Michael’s and A.C. Moore. I was left to fend with the interesting things my father would bring home from his jobs. Having lived through the Depression he couldn’t bear to discard anything of potential use. He was always bringing home treasures like Formica sample chips from the hardware store, a bagful of window shade trimmings, a box of thick cardboard tubes. The crowning find he brought home was a sewing machine, complete in a wooden cabinet, just for me! Although I was only armed with a stack of various colored floral flannel squares, purchased at a nightgown factory, I sewed to my heart’s content. I was also blessed with a godmother who sewed, and I can remember following her around taking notes in an attempt to write my own how-to-sew manual. I also had my wonderful Auntie Irene who taught me how to crochet when I was little, holding the hook the old fashioned way which I still stubbornly do. 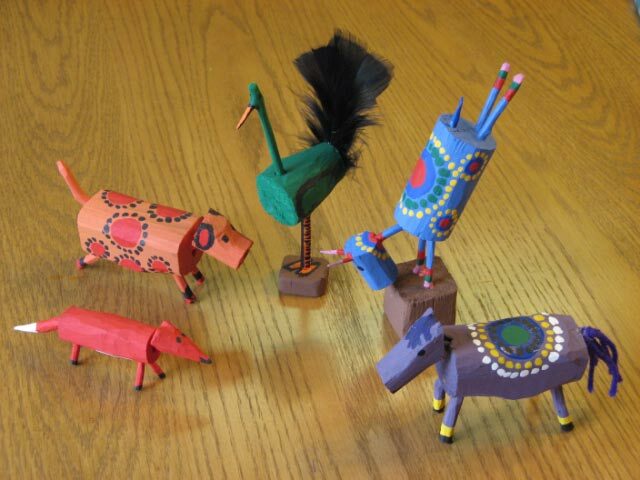 Last year Jonathan carved some dancing goats for me, replicas from Patricia Polacco's book. This year he added to the collection with these of his own design. 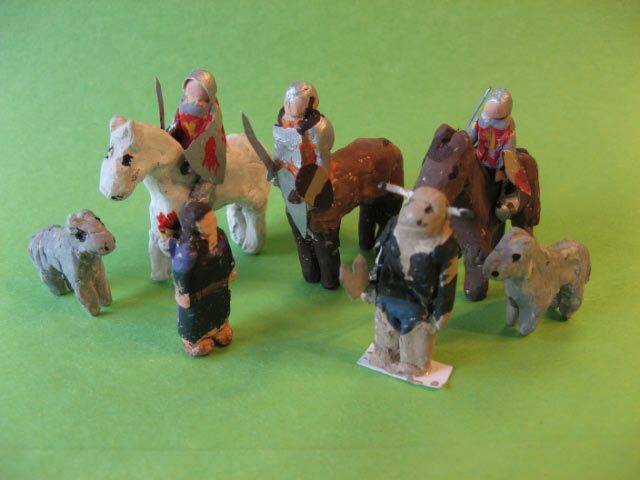 Josiah crafted these wee Narnia folk out of clay- Susan is merely an inch tall! 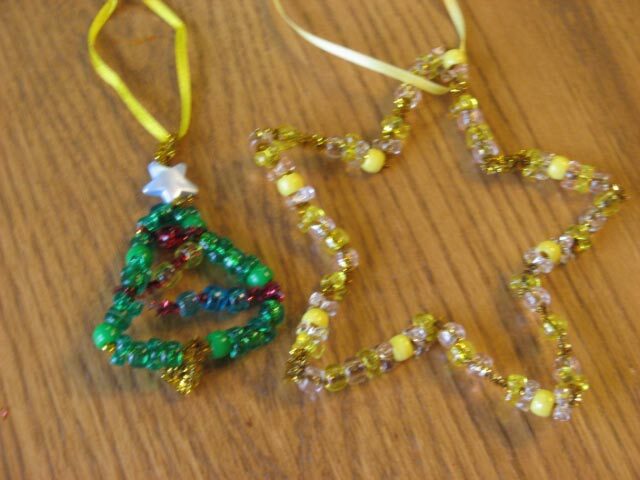 Mary Rose beaded these ornaments, while Anna Ruth provided the Bitty Babies with new dresses, and Lydia made the pink crocheted skirt. 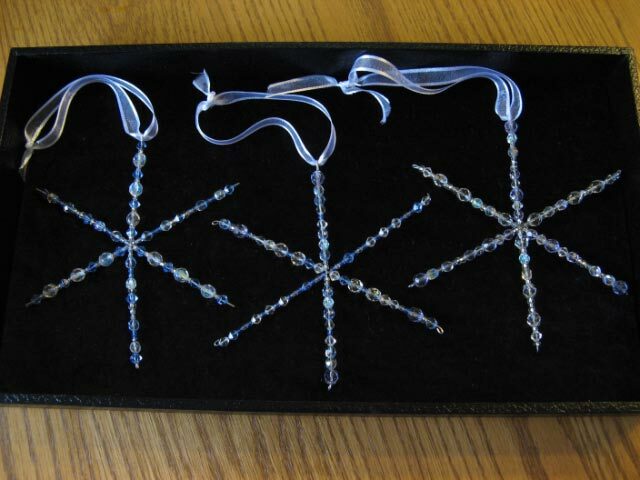 Like Donna, I received beaded snowflakes from Jonathan. 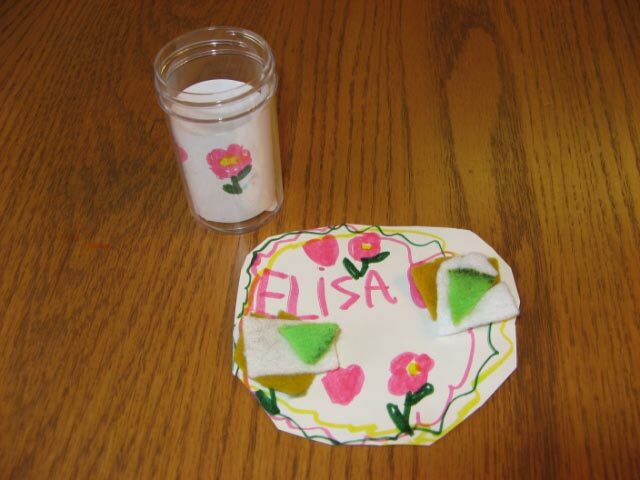 Mary Rose fashioned a set of milk and cookies for Eliza, while Lydia created Kateri's first ornament. Jonathan gave Lydia a crash course in one stroke painting, and so I received this lovely box. No Christmas would be complete without Josiah making airplanes! 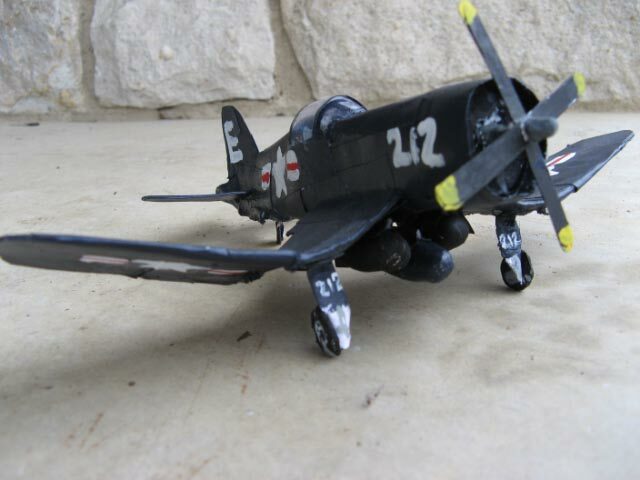 He made this Corsair for his Dad out of paper (! ), with foldable wings and a removable pilot out of clay. 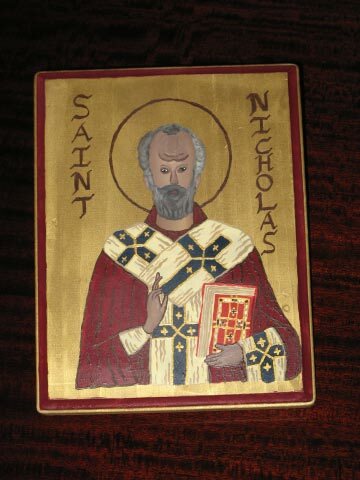 Inspired by Katherine, the children colored icons of St. Nicholas on his feast day. Jonathan opted to paint his own, and it came out so nice he gave it to his Dad as a gift. 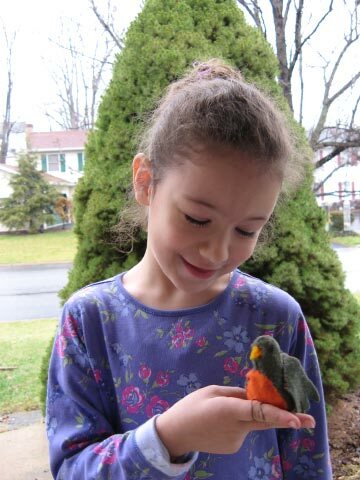 Lydia fashioned this little robin of felt for Mary Poppins Rose to sing and whistle with. 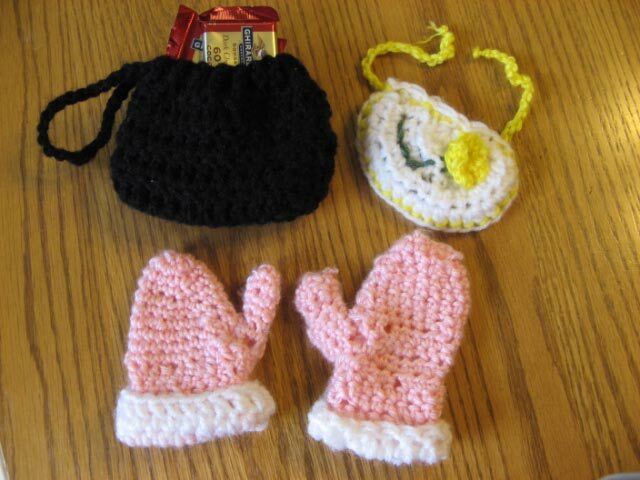 Every baby girl needs pink mittens, every Bitty Baby needs a flower bib, and every Dad needs a pouch for his chocolates! 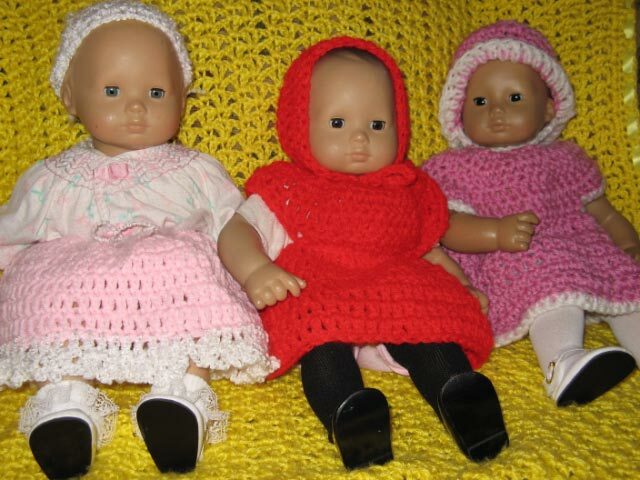 The crochet girls were happy to oblige! 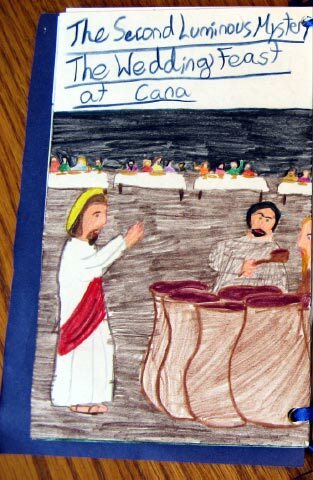 The picture down below of the Wedding Feast at Cana was done by Lydia. She made a book for Mary Rose illustrating all twenty mysteries of the rosary. 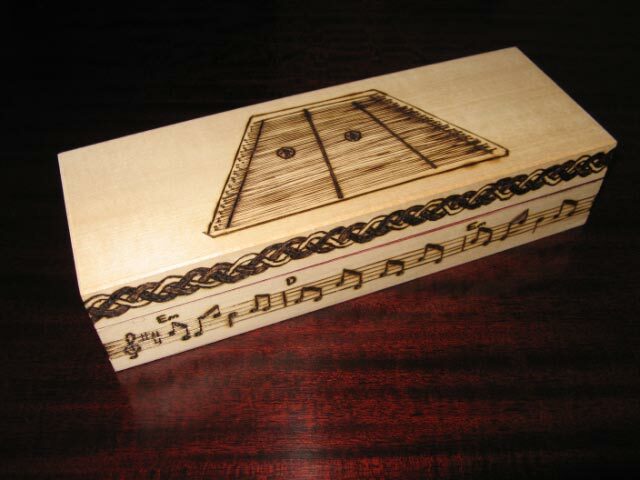 And finally is a box Jonathan wood burned for Josiah to keep his dulcimer hammers in. The music is 'Johnny Has Gone to France', one of Josiah's favorite tunes to play. 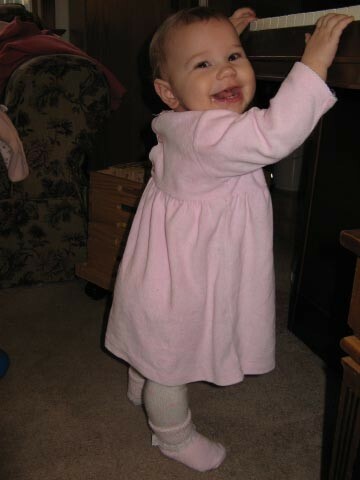 She's not even nine months old yet! Sit down while you can, girl! "Why did Jesus turn the water into wine?" "Because His Mother asked Him to." I love teaching this story to the little ones. It is so very simple for them. And it should be simple for us as well. The children don't ask about going directly to Jesus. They don't ask why Mary interceded for the bridal couple. They just accept it. Didn't Jesus know they ran out of wine? Of course He did. And He also knew that one day while hanging in agony on a cross He would present His Mother to all of us. The greatest gift besides Himself that He gives us. He knew we would all need a Mother. He knew she would always tell us to do whatever He says. How many times a day do I run out of wine? What would I do without my Mother to run to? To cry out to? Mother, I've run out of patience. Mother, I've run out of wisdom. 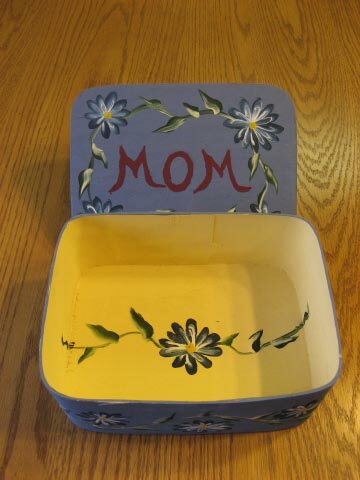 Mother, please notice I'm empty. 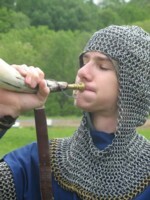 Mother, I need Him to change me into new wine. Oh, what a beautiful gift this gospel story is for us! I was filled with such joy listening to it at Mass this morning. What an amazing gift Our Lady is for us! Our Lord could have entered this world without a Mother. He could have begun His public ministry without a Mother. He could of left all of us without a Mother. But in His infinite mercy and goodness, God knew we needed a Mother. It is with great joy that we now meditate every Thursday on this First Luminous Mystery - the Wedding Feast at Cana. Let us always appreciate the great gift of Our Lady, and pray also for those who are not close to Our Dear Mother, that they may come to know her tender care. There are often little perks in going to Daily Mass, such as when the priest announces that all of the holiday decorations are about to be removed and all of the flowers are free for the taking. I quickly decided on two huge hanging pots, each containing a beautiful cascading mixture of red and white, to adorn each side of the fireplace in our music room. Many other people were selecting flowers as well, but it was soon evident that there were more flowers than willing takers. The efficient church ladies were quickly stuffing the excess flowers into huge trash bags. Upon seeing this I easily convinced my brood we could manage a few more plants. 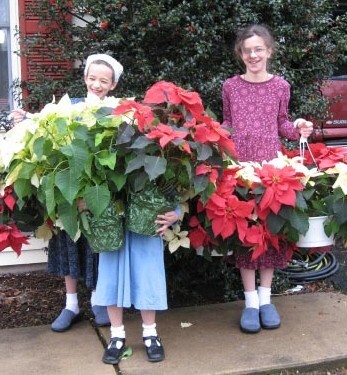 We ended up with five gorgeous pots of poinsettas bursting with blooms, and a quiet little ivy to boot. Being an ardent flower lover, I was practically giddy as we stuffed all of these flowers into our Suburban with glee. I was positively delighted with my floral fortune. On the drive home I kept exclaiming it smelled like a florist's shop. So many flowers! But then Mother Teresa's famous pro-life quote popped into my head, "How can there be too many children? That is like saying there are too many flowers." I was haunted by the image of the beautiful blooming flowers being thrust unwanted into their plastic trash bags. How is it that just minutes before they were considered beautiful church decorations, and now they were just trash simply because they were no longer wanted? Just like the children. How horrendous the plight of so many babies, simply because they are 'unwanted'. The wondrous beauty of an unborn child, so intrically knit with love by the hand of our Creator, that miraculous beauty is present in every child. How can it be that one child is loved and cherished and another is considered unwanted trash? How can it be? And so my flowers delight me, just as my dear children do. And they also break my heart, because they remind me of the babies. Just as my dear children remind me of the babies. The 'unwanted' ones. 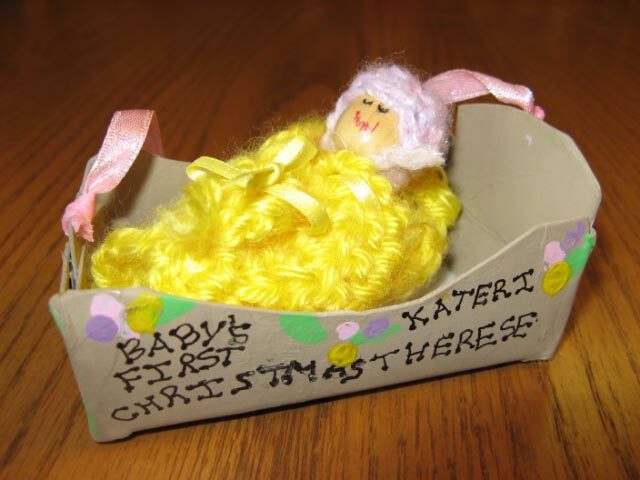 During this month of January we are reminded of the babies. May we continue to pray and plead for their protection. Goes to my dear husband of course. He stayed up late designing and configuring my blog for me. The lovely banner is a photo of our clematis in bloom that he took one spring. He understands my need for 'pretty' and my craving for all things floral. He also cleverly tweaked the colors codes so everything matches. Thank you dear - I love you!